Bison hunters are having a slow harvest this winter. Only a few have been taken so far. 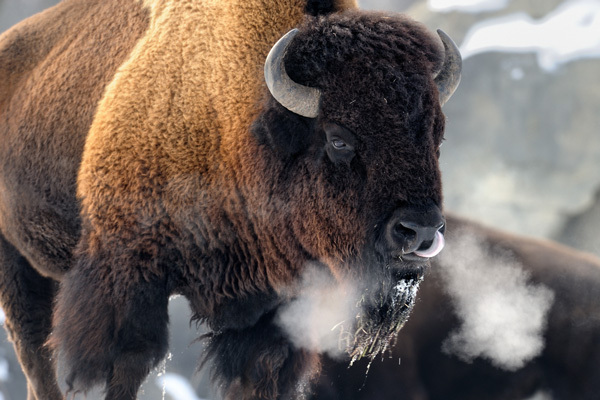 Most of the Buffalo have stayed inside Yellowstone Park where they remain protected. A milder winter and less snowpack are responsible for the lack of migration. Most of the hunting is done by the Native tribes. Confederated Salish and Kootenai tribes get first dibs. Their hunt runs into March. The Park is shooting to manage 4,500 Buffalos. This means that 600-900 critters need to go. The habitat can only support a certain Carrying Capacity. Limited space, food, and habitat determine the health of the herd. In order to manage the populations, the herds need to migrate. Many of them exit the Park near Gardiner. So far, the herd is comfortable, fat, and happy staying in the park. This lack of migration is not uncommon. Our recent cold weather should encourage the herds to migrate later in February. Some will be trapped for isolation in the storage pens near Gardiner. Once tested for Brucellosis, these critters can be then be slaughtered for meat or sent to tribal lands. Hunting seasons may be modified if the reduction is not adequate.